BEN M. CARPENTER, 91 of Memphis died on Saturday, August 23, 2014 at 2 a.m. He was married for 52 years to the late Lillie Walker Carpenter, attended Central High School and Memphis State College, was President and founder of The Time Shop, Inc., a charter member of Christ United Methodist Church, served Navy combat duty in the South Pacific for two years during World War II on board the USS Natoma Bay aircraft carrier, was a member and officer with the Exchange Club of Memphis for over 40 years and a long standing member of the WTHS since 1976. 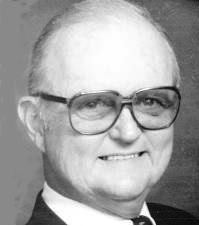 Dr. John Harkins remembers Mr. Carpenter as a highly credentialed and very savvy parliamentarian; who helped the society thoroughly redraft its obsolete by-laws in the late-1980s. In addition, he was a great advocate for and teacher of accurate parliamentary procedure, helping clubs and civic organizations to mind their Robert’s Ps and Qs.